We had a sensational event last Sunday at the Cube at QUT. Mind blowing seeing our 15 teams from primary and secondary showing off their apps to our 350 strong audience. We had great Masterclass with Genie Solutions and a very popular UX workshop with Suncorp who have provided amazing mentors this year for our teams in the competition. The Honourable Leeanne Enoch, Minister for Innovation, Science and the Digital Economy and Minister for Small Business gave an inspiring speech, and announced our Qld State Finalists and awarded them their prize - you can read all about their incredible innovations here. Dr. Catherine Ball - our Dame of Drones - was our brilliant MC for the day, giving us many reasons why we should buy a drone for Christmas :) Listen to her podcast series here. She interviews our very own superhero Dynazap for her first podcast! Our very own Jewella donned a new red cape to greet our many tech girl guests, including a special gift to thank the Minister, and the obligatory cupcakes were inhaled by the masses - an obvious hit! 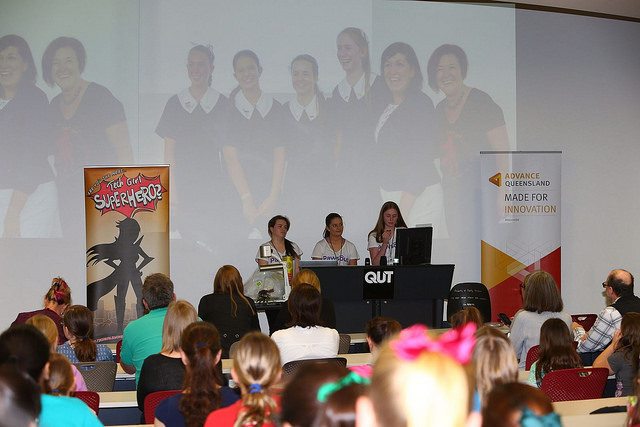 With speeches from Associate Professor Peta Wyeth from QUT, Kathy Carr from Technology One, Orla Fourie from Suncorp and our very own Tech Girls Movement Ambassadors Team Pawsout talking about their amazing adventures with us over the past 12 months, it was a jam-packed day full of laughs, fun and technology. 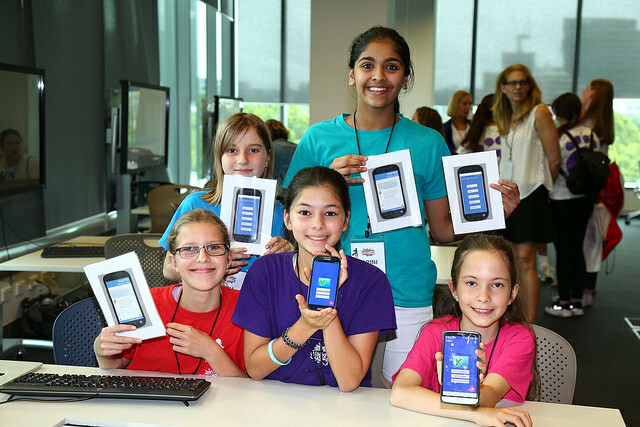 We awarded our local Qld teams their prizes: Clayfield College won the Secondary Prize with their app Study Buddy and Mt Gravatt East State School won the Primary Prize with their app Bye Bye Cultural Bullying. Love the look on their faces when we announced them as winners! A special shoutout personally from Jewella goes to our talented team from Ormiston College. They used makey makey to add sounds to some of our tech girls stories like Jewella and Enthusiastica - opening up a whole world of possibilities for people to interact with storytelling and technology. Also a thanks to Finn and Mikayla from West End State School who were our (9yo) roving reporters on the day. 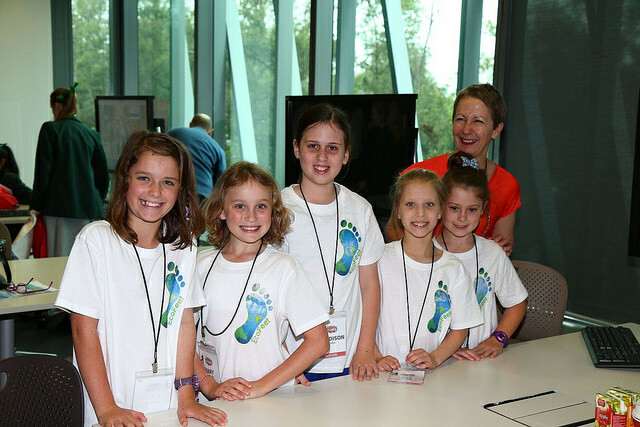 We are so inspired by all of the tech girls who participated in the competition, and who attended on the day. Next up, Sydney, Perth and Melbourne showcases this week! See you there tech girls. Then let's take over the world with the global Technovation Challenge - New website coming soon so stay tuned! You can also read about us here in the ABC news, and here in the Source News.